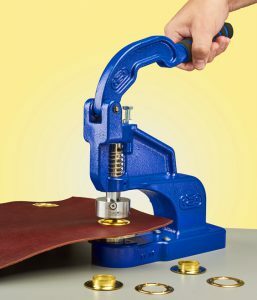 A new, seventh generation metal grommet hand press that is designed for installing grommets into thick leather and similar materials is being introduced by METALgrommets.com of Dighton, Massachusetts. 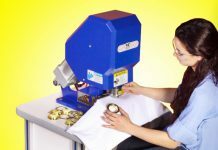 The ClipsShop® CSTEP-2 Hand Grommet Press is portable, easy to operate, and features an ergonomic force-advantaged lever with a comfortable foam handle that creates 1,200 lbs. of attachment force. Designed to apply large grommets to thick leather and other heavier materials, it has an adjustable bottom stop that prevents over crimping and assures consistent and repeatable grommet applications.